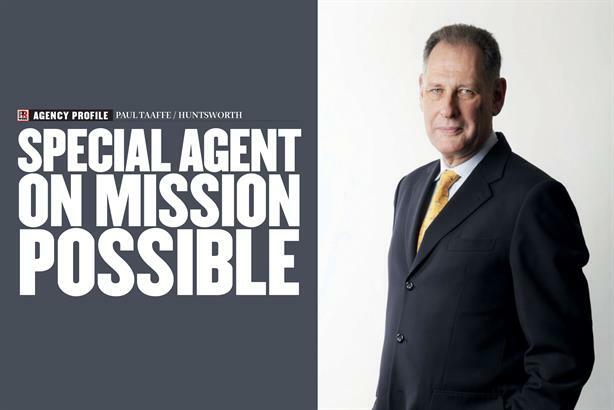 The future has looked bleak for Huntsworth with falling revenues and a boardroom overhaul, but new CEO Paul Taaffe is looking to steady the ship and relishes the challenge of steering the group towards profitability and growth again, finds John Harrington. To describe Huntsworth’s recent history as ‘troubled’ would be like calling South Africa’s recent Rugby World Cup defeat by Japan a ‘minor upset’. A turbulent 12 months has seen the departure of founder/CEO Lord Chadlington, chairman Lord Myners and Pete Pedersen, chief executive of Grayling, alongside dismal trading results. Pre-tax profits at the Red, Citigate Dewe Rogerson and Huntsworth Health owner plunged around 20 per cent last year, and the trend has continued into 2015, with first-half profits dropping about a third as the group announced a further impairment charge of £48.8m. There were reports Huntsworth could be dismantled, with shareholder Terry Gauke rumoured to be interested in a merger with Engine Group, recently acquired by his Lake Capital vehicle. All this could not have made happy reading for the man hired to steady the ship, but new CEO Paul Taaffe is philosophical: "I’ve always enjoyed working in difficult and challenging places. It’s far more satisfying to make a real impact on the business and people’s lives and clients than just take something that’s humming along nicely and doesn’t require any real change." He is reticent about discussing the reasons behind Huntsworth’s recent woes, but observers have pointed to the overexpansion of Grayling in the US along with overexposure in Europe as the company struggled to recover from the global downturn. But if anyone can solve a problem like Huntsworth, one feels Taaffe has a greater chance than most. The former Unilever and Weber Shandwick PR man gained a reputation as a shrewd operator during his time at Hill & Knowlton, where he was appointed UK CEO in 1992 aged just 30. Taaffe eventually became global chair and CEO, a position he held for eight years. A four-year stint as Groupon’s first comms director followed – he describes moving in-house as "therapy" – before Huntsworth came calling. Affable and straight talking are other qualities associated with him; perhaps partly by dint of his Australian background. Both descriptions ring true when meeting the man in person, although Taaffe appears serious and determined when discussing the challenges he faces. 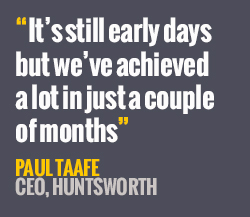 So what is Taaffe’s plan to take Huntsworth back from the brink? Interestingly, he sees the group’s woes as primarily structural and operational rather than a due to "fundamental problems" with the agencies, which he describes as "faster, more dynamic" than their rivals. "My objective was how I help them become more special and faster," he says. "My first aim was: could we improve the growth profile of those companies? The second was: what was the sustainable growth model for each one of those businesses?" 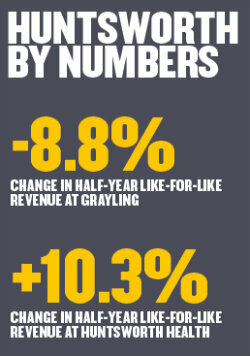 One agency most obviously in need of help is Grayling, where like-for-like revenue slid 8.8 per cent in the first half of 2015 as it delivered margins of just 2.3 per cent. As well as Pedersen, notable departures have included Alison Clarke, CEO of the UK and Ireland business. PRWeek puts it to Taaffe that there is a perception Grayling has suffered from a failure to adapt. "I’m not sure that’s correct," he responds. "I’m very familiar with other agencies around the world and I’m not so sure Grayling didn’t have anything other agencies had. If something was missing it was perhaps the ability to come together." Sorting out Grayling’s structure has been a key objective following Taaffe’s wide-ranging review of the holding company. Property issues were dealt with swiftly, with five Grayling offices closed across the world. Taaffe says these represent a fairly small part of the business, many relating to the "messiness of past acquisitions". That is not to say retrenchment is imminent, and Taaffe is targeting the Middle East and Africa as growth areas for Grayling. Meanwhile, there has been an overhaul of the senior leadership team in key markets such as the UK, where Sarah Scholefield has replaced Clarke, while European CEO Jan Simunek was given an expanded role. Across the agency, 50 staff have been replaced as the focus switched to client-facing employees ("because clients tend to pay our bills", Taaffe quips). "It was a very fast clean up, which is almost complete," he explains. "What I was concerned about was: could we continue to attract good talent? Almost all the recent hires have been exceptional, so it tells me that we can." Elsewhere, Citigate – Huntsworth’s financial agency – has also had a tough time, experiencing like-for-like revenue decline of 7.2 per cent in the first half of 2015. Taaffe points to fierce competition, particularly in London. The agency continues to win accounts, but he stresses: "Pricing pressures are particularly difficult." Again, his solution is to make Citigate more special in its market: "You can no longer talk just about financial comms. You’ve got to talk about, for example, financial comms to the life sciences sector or the energy sector. You have to go to that next stage, so we’re in the process of doing that." For Red, Huntsworth’s "small but perfectly formed" consumer agency, the picture looks rosier after it narrowly returned to growth in the first half. "They’re certainly a special agency that’s in a differentiated UK market. As they move into more digital as a percentage of the revenues, there are a lot of opportunities to grow," he says. Taaffe’s approach to digital has "absolutely" been informed by his time at Groupon, he says. "What [Groupon] is doing is so much more sophisticated in relation to social media, paid marketing, how it uses its website, how it tweaks it, or with email, than most other companies. That was like going back to school." Amid the turmoil at Huntsworth, the one true star has been Huntsworth Health, which delivered 10.3 per cent like-for-like revenue growth in the first half. Is the success due to the strength of health marcoms or of Huntsworth Health in particular? "Both," Taaffe replies. "That category is very robust right now and is predicted to be for some time. But Huntsworth Health is taking market share for a host of reasons, and that is to do with the quality of the people." About 100 employees of the division have PHDs; a big advantage, says Taaffe, as ‘big pharma’ moves its focus to rare diseases that require greater expertise. He also singles out Huntsworth Health’s integrated approach, spanning digital work to consumer health advertising, and branding to medical comms. 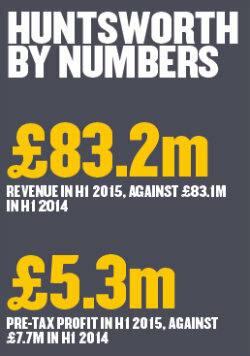 PR, incidentally, accounts for 10 per cent of revenue. More generally, Taaffe sees the Middle East as a region for growth for Huntsworth, while more mature markets such as the US and UK "always comes at a much higher cost". He names Germany and Brussels as individual markets primed for expansion, and sees "natural growth" in Asia.Taaffe views Huntsworth Health as the company’s growth engine, predicting it could "easily" expand by 50 to 75 per cent over three to five years. Particular opportunities lie in the US, thanks to ‘Obamacare’ resulting in more people with medical insurance who can afford drugs. Taaffe sees "no immediate need" for disposals but will "stay vigilant". More positively, he stands by his prediction that all four parts of the business will be in growth within the year, adding that he is "impressed with the speed" at which change has been embraced – at Grayling in particular. Despite the challenges, Taaffe is clearly enjoying himself: "I’m working with great people; I’m really impressed with some of the quality and intellect. They’ve got some amazing clients. It’s still early days but we’ve achieved a lot in just a couple of months." Only time will tell if those achievements will translate into improved financial performance. But there will be quiet optimism that under Taaffe’s leadership it could be sooner rather than later.